With the carbs off the bike for cleaning, now is a good opportunity to go through the electrical system. While looking at the main wiring harness can make any bike seem overly complicated the truth is, once you break it down into individual circuits, there isn't much to it. First off is the charging system made up of the battery, alternator, rectifier, and voltage regulator. This is arguably the most important circuit on the bike as it provides the consistent power that all of the other components rely on. All too often we find people still using the original charging components which are failure prone; not a good situation on a bike that never had a stellar charging system to begin with. Next, we look at the ignition system made up of the contact points, ignition coils, condensers, spark plugs, boots, and wires. This is the other critical circuit, as it provides the proper spark at exactly the right time for the engine to function, bike to move, and the charging system to, well, charge. Kind of a chicken-of-the-egg situation there. In addition to renewing the parts and setting the ignition timing, this is a good time to make sure the mechanical advance mechanism behind the points plate is functioning as it should. Before, During, and After cleaning and lubricating the mechanical advance mechanism. Finally, we went through the lighting and control circuits made up of all of the bulbs (headlight, tail light, turn signals, indicators), switch boxes, flasher relay, electric starter and so-on. These components don't directly impact the operation of the engine, beyond drawing current from the charging system. Aside from inspecting these components, there are a few upgrades to reduce current draw, such as a more efficient headlight bulb. When doing any electrical mods it's always good to reference the factory Wiring Diagram. There is always the chance that some of the parts we replaced may work just fine, or that someone replaced them already. Deciding which parts to swap out is ultimately up to you (the owner of the bike) but we've found after much gremlin chasing, head-scratching, and cursing that you're generally better off replacing these particular parts preemptively as 40 years of use, abuse, and neglect often leaves them falling short. Meanwhile, on the bench, the carburetors got a full rebuild with a good cleaning and some carb kits. Aside from the ignition system, your fuel delivery system is the other key variable in the tiny-explosion-equation. If either cylinder is not getting the air/fuel mixture it needs, your bike will never run properly. 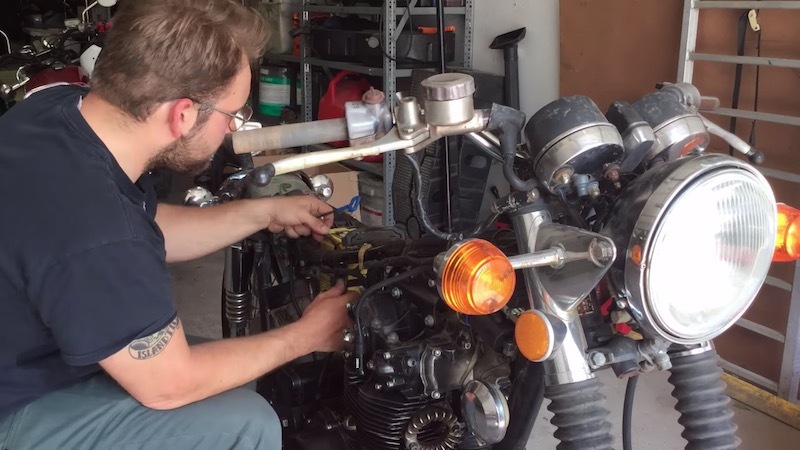 We went ahead and used the carbs from our Long Haul bike to film a new Honda CB450/CL450 Carburetor Rebuild Video. Finally, once the carburetors are rebuilt, they must be synchronized before reinstalling them on the bike. The following video address how to sync the carbs for a Honda CB350 or CB450. While the carbs are different in design between the two bikes, the synchronization technique is identical.